September 10th, 1951 marked a series of sightings that would prove to be the impetus for a serious reevaluation of the Air Force investigation into the UFO phenomenon. This would lead directly to the establishment of Project Blue Book. The incidents began when an Army Signal Corps radar operator at Fort Monmouth, New Jersey, picked up an unknown flying target at 11:10 A.M. moving faster than the automatic setting mode could plot. The UFO followed the coast line, estimated at a speed of 700 miles per hour. Twenty-five minutes later at 11:35 A.M. a T-33 jet piloted by Lieutenant Wilbert S. Rogers with Major Edward Ballard on board may have encountered that same object. They were flying over Point Pleasant, New Jersey, when Rogers spotted a “dull silver, flat disc-like object.” It appeared far below their aircraft which was then at 20,000 feet. Ballard confirmed the pilot’s observation as both crewmen estimated the craft to be around 30 to 50 feet in diameter. The UFO proceeded to descend toward Sandy Hook as Rogers nosed the jet down to investigate in a 360-degree descending turn. As Rogers executed that maneuver the unknown countered with a 90-degree turn to the left. By then both men knew they were not chasing a balloon. This UFO was not only banking left but was by then out-pacing their jet which Rogers had throttled up to 550 miles per hour! He then attempted to parallel its course from his current altitude of 17,000 feet, but it soon vanished out to sea. Later that afternoon at 3:15 P.M., Fort Monmouth, New Jersey, radar picked up an object eighteen miles above the earth traveling slowly. Soon ground observers visually confirmed it although they could only see a silver speck. That sighting did later prove to be a balloon, but as a direct result of all of these Fort Monmouth, New Jersey Reports and some other odd radar reports the next day, many senior military leaders became concerned. So much attention came to bear on the incidents that the Air Force Headquarters Intelligence director at the Pentagon, Major General Cabell, asked Air Technical Intelligence Center chief Harold Watson, in Dayton, Ohio, to look into the matter. Since 1948 the ATIC in Dayton had been responsible for collecting and investigating UFO reports. Yet even before these incidents took place, General Cabell had come under pressure by many U.S. industrialists and scientists who felt the Air Force should be more forthcoming about UFO reports. They felt a renewed investigation should take place on a scale equal to that of 1948 during the first investigation named Project Sign. Cabell, who had once characterized the later Grudge Project and its report as “the most poorly written piece of unscientific tripe I’ve ever read,” seemed ready himself for a more serious study. That summer Cabell passed the mounting pressure on to Watson at ATIC although after the Fort Monmouth, New Jersey Reports, Cabell sent word down that he was even to be awakened during the middle of the night if he was needed! Ironically, Watson had such a disdain for UFO sightings that initially he had hesitated to even forward the Fort Mommouth reports to Washington. In fact, when word of the incredible sightings first came into Dayton, the accounts were dismissed by Watson’s head of intelligence analysis, Colonel Bruno Feiling. Feiling completely bypassed Grudge and gave the report directly to James Rodgers who had once been in charge of the Grudge project and was Watson’s right-hand man. Apparently an argument of sorts soon arose within the ATIC offices as the New Jersey incidents gained more and more publicity. Finally, the report was sent to the Pentagon (apparently by some unnamed subordinate going over Watson’s head). In response, Watson soon found himself in a heated conversation with Cabell. By then Watson knew he had to act fast, so he sent Lieutenant Colonel N.R. Rosengarten to New Jersey to conduct an investigation. Rosengarten then served as chief of Aircraft and Missiles at ATIC and technically had the old Grudge project under his many duties. He took with him intelligence officer Lieutenant Jerry Cummings who had actually taken over the administration of Grudge from James Rodgers. Although Cummings had only recently come to Grudge and, like Edward Ruppelt, had been reactivated with the start of hostilities in Korea. Ruppelt’s opinion of Cummings was very high, and it is evident from the UFO files that a more serious approach was taken as soon as Cummings was ordered to administer what was left of the Grudge operation. As a matter of fact, both Ruppelt and Cummings had desks in the same building. Ruppelt noticed that when Cummings was given the defunct operation, it had been due to Watson rewarding Rodgers with better duty. Yet during the transition, both Ruppelt and Cummings came to learn the history of Watson and Rodgers’ misadministration of Grudge. Rosengarten and Cummings thus took great interest in their trip to New Jersey because it gave them the chance to finally investigate a really good report without direct interference from Watson and Rodgers. After arriving on the scene via a commercial airliner direct from Dayton, they worked around the clock to interrogate the radar operators and all participating technicians at Fort Monmouth. Following their investigation, Rosengarten and Cummings interrogated the T-33 pilots in New York. After that they headed to Washington to brief Cabell but couldn’t get an airliner out of New York in time to catch a scheduled 10:00 A.M. meeting, so they charted a private plane. When they reached the Pentagon they found themselves participating in a very intense briefing with not just Cabell, but other top Pentagon Intelligence officials. By the start of the meeting it is apparent that Rosengarten and Cummings had not only become impressed with the reports, but decided to take it upon themselves to put an end to Colonel Watson and his anti-UFO policy. We now know that during the meeting Cummings (with approval from Rosengarten) told Cabell all he knew about the behind-the-scenes influences on Project Grudge. Cabell thus came to the realization that Watson had been deceiving him. He learned that since Watson took charge at ATIC in July of 1949, he had been intentionally downplaying sightings. Watson, he discovered, had been persistently debunking UFOs—even going out of his way to grab publicity to do so. He had even talked with reporters and columnist Bob Considine and branded all those who saw UFOs as “nuts,” or “fatigued airline pilots.” This greatly insulted U.S. service personnel who had filed many UFO reports themselves. Yet not until this meeting did Cabell fully realize that Watson, along with his confidant and former Grudge project leader James Rodgers, had run Grudge into the ground. Cabell replaced Watson with Colonel Frank Dunn that very month. Other heads rolled too. Soon anti-UFO men in the Pentagon like Major Jerry Boggs were also out. Cabell then ordered ATIC to reactivate or create a new Project Grudge—hereafter referred to as New Grudge. But as urgent as the orders appeared, no one really seemed to want the added duty. Dunn proceeded to put all the responsibility on Rosengarten who then put it on Cummings, but Cummings soon left the Air Force for an assignment at the California Institute of Technology. So, the task went back up to Rosengarten. On September 16th he passed it on to Lieutenant Edward Ruppelt and Lieutenant Henry Metscher who had worked with Cummings on cases like the famous Lubbock Lights Incidents in Texas. Ruppelt had been a decorated B-29 bombardier during WWII. In fact, during the war he won five battle stars, two theater combat ribbons, three Air Medals, a Distinguished Flying Cross with Oak Leaf Clusters, and a Presidential Citation. Ruppelt had gone over with the first B-29 squadron to India and followed it to Tinian Island. He remained in the 20th Bomber Command throughout the whole strategic bombing campaign of Japan and even flew on the last conventional raid of the war. After being decommissioned he entered Iowa State College and earned a BS degree in aeronautical engineering by 1950. With the outbreak of war in Korea he received a recall to duty from the Air Force and came into Intelligence at Wright-Patterson AFB. Given work immediately on classified projects, Ruppelt soon gained a reputation at ATIC as a problem solver. Although he would prove to be the best administrator of a UFO project the Air Force would ever have, he did not have the credentials or rank that would normally be drawn upon for what on the surface seemed an important intelligence assignment. Only 28 years old at the time, Ruppelt was not a career officer. Still a lieutenant by that fall, it is very odd that any non-career tracked officer would be put in charge of a project as important as one involving possible aerial intrusions into United States air space. He had, however, impressed Rosengarten for some work he did on a captured Korean/ Soviet Mig jet. Because of the meticulous reports and files Ruppelt kept, he was without doubt highly valued at ATIC during a time that personnel resources were being strained by war in Korea. And as anyone who knew Ruppelt will testify, he became instantly liked by all he served with, winning not only their respect but earning it through a high degree of devotion to duty. In sort, Ruppelt was a team player and sweated the details. Ruppelt not only took the job seriously but expected his staff to do so as well. If anyone under him either became too skeptical or too convinced of one particular theory, they soon found themselves off the project. At no time, however, was New Grudge or Blue Book more than fact-finding groups and never regained the serious attention besotted on the early Sign investigation of 1948. Ruppelt’s project was basically a military operation within ATIC and did not have the highly skilled civilian engineers employed by Sign like Alfred Loedding. Nevertheless, Ruppelt did professionalize the project by using a standardized questionnaire developed by Ohio State University for UFO witnesses to describe their sightings. He sought further scientific help from a preexisting contract with the Battelle Memorial Institute in Ohio. Already code named Project Stork, it assisted in the evaluation of statistical data produced by the Air Force investigations. (Project Stork had originally been set up to evaluate the Soviet Union as a military threat and when UFO analysis was tacked onto their duties, that part of the study became known as Little Stork.) He then secured Dr. Hynek, already an Air Force consultant in astronomy, as chief scientific consultant. Ruppelt contracted the Romeike news clipping service as well, (from May through September, 1952) bringing many UFO reports to ATIC that would have not been reported otherwise. The most visible change Ruppelt made involved a regular series of briefings that he gave to Air Force and military officials around the country. He then moved to implement a suggestion from General Cabell that would put cameras on the Air Defense Command’s more than 30 radar scopes around the country. Inspired by University of California physicist Joseph Kaplan, Ruppelt also attempted to develop special diffraction grid filters for camera lenses that could be used from aircraft or ground stations. Some duel lens models were called Videon cameras. With one of its lenses filtered, Videon cameras would be able to capture an object’s color spectrum and compare it to that of aircraft, stars and meteors, as well as its own unfiltered view. By comparing the two, at least non-anomalous occurrences could be weeded out. One of Ruppelt’s actions affects us to this day. Prior to 1951 no one used the phrase unidentified flying object. Different combinations of the phrase were mentioned in the Sign project correspondence but as a catch word it did not really exist. Up to that time even sternhigh-ranking generals commonly talked of discs or saucers. Such phrases made Ruppelt uneasy. Realizing the complexities of the phenomenon, he insisted on popularizing “UFO.” It took several years, but his persistence eventually dissuaded the use of “flying saucer” in serious discussions. 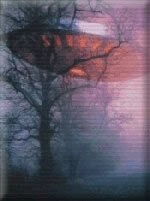 As 1952 dawned, UFO reports began to gradually climb. Ruppelt and ATIC chief Colonel Frank Dunn attended a Pentagon briefing about that time with the new Air Force Intelligence Director, Major General John A. Samford. (Samford had replaced Cabell as head of Air Force Intelligence when Cabell took up the number two position at the CIA.) Samford already seemed very well informed about the UFO problem but soon appointed his Assistant for Production, Brigadier General W.M. Garland, to oversee liaison with ATIC’s New Grudge. Garland had been very close to Samford in the Pentagon and Ruppelt described Garland as a “moderately confirmed believer.” He learned that Garland had once seen a UFO while stationed in Sacramento, California. From the fall of 1952 on, Garland would serve as Ruppelt’s boss. In the summer 1952 Ruppelt found himself in the middle of the largest UFO wave to date. The excitement caused by that wave led the CIA into the picture because the Truman administration feared a possible hysteria developing over the subject. This in return led to a CIA- sponsored discussion of UFOs known as the Robertson Panel in January of 1953. Stamped “Secret,” the Robertson Panel’s report (formally known as the Scientific Advisory Panel on UFOs) sent its recommendations to the Secretary of Defense, the Director of the Federal Civil Defense Administration, Chairman of the National Resources Board, and former Intelligence Director General Cabell, but not to Ruppelt or his ATIC superior General Garland. Ruppelt may have been head of Blue Book, but it was not until later that he and Garland were briefed. During their meeting the CIA intentionally lied to them, stating that the panel had actually recommended the expansion of Blue Book and the declassification of its files. Ruppelt left the meeting very excited. He made plans for the utilization of more personnel, the final implementation of the camera surveillance, and media release of more classified files as Air Force press assistant Albert Chop had already done via popular UFO writer Donald Keyhoe. In fact, Keyhoe had just been briefed on the famous Tremonton Movie and eagerly looked forward to a more forthcoming policy from the Air Force. But, it never happened. While Ruppelt waited for his promised increase in staff and the new projects to be implemented, he received a temporary transfer to non-UFO related duties in Denver. (During that period he attended an advanced intelligence course at Lowry AFB from April 7, 1953, to July 3, 1953.) Then after a brief return to Blue Book Ruppelt was deactivated with the end of the war in Korea. The increase in staff never came nor did other plans. Fearing that the Air Force’s seagull explanation for the Tremonton Movie would not be believed, it remained classified until 1956. General Garland may have then become aware of the true nature of the panel’s recommendations because he reframed from speaking out on UFOs until he left the Air Force for a job at Rand. (In late 1953 Garland tried but failed to have Blue Book transferred over to the Air Defense Command.) Ruppelt seemed to have been kept in the dark about the actual magnitude of the Robertson Panel up until the time of his sudden death from a heart attack just seven years later. And, the public as a whole would not learn the full details of the Robertson Panel report until it was declassified in the summer of 1966. But because of the military’s slow bureaucratic nature, the Robertson Panel’s recommendations took a great deal of time to be implemented. Through most of the first half of 1953 Ruppelt and his temporary replacement, Lieutenant Bob Olsson, continued operating Blue Book much as it had been the year before. The only major hindrance concerned getting replacements for staff members and of course the fruitless waiting for the increase in staff which never came. After being reduced to only two subordinates, Ruppelt had to become resourceful. He suggested utilizing other intelligence units for field investigations which eventually resulted in the use of the recently activated 4602nd Air Intelligence Service Squadron (or AISS) for that task. Ruppelt’s actual end at Blue Book came with the close of hostilities in Korea in August of 1953, thus ending the most significant period in the project. At the time of his departure only two assistants remained out of what had become a ten-person section. That same year Pentagon liaison Dewey Fournet and Albert Chop left, being the last to openly lean toward the extraterrestrial hypothesis in the “Age of Ruppelt.” Chop had actually resigned his post following an accusation by the Air Force that Donald Keyhoe had fraudulently obtained sighting reports for his upcoming book. Yet, Chop had released the reports to him with full permission from Air Force intelligence and produced a signed affidavit to that effect. For a period, Blue Book fell under the sole authority of one noncommissioned officer, Airman First Class Max Futch. Futch was a hard drinking Coca Cola man who not only kept himself going during the long days of the summer UFO wave of 1952 but served as Ruppelt’s right-hand man in the office. Ruppelt placed great confidence in Futch and could always rely on him. But Futch soon left the service along with Bob Olsson—both heading for law school. After that ATIC assisted when needed to investigate reports, but from that point on the project primarily became a repository for files. Most field investigations were turned over to the nineteen scattered 4602nd AISS units of the Air Defense Command. With Ruppelt’s departure from Blue Book, the first significant effects of the Robertson Panel recommendations can be detected. It began with the reissuance of Air Force Regulation 200-2 to all American Air Force bases. This regulation put initial responsibility for investigating UFO sightings back with the commander of the air base closest to the event. Amendments would later state that only the 4602nd should make investigations unless there was not an AISS unit in the vicinity, and then the base commander could send a report to the one nearest him. USAFBs were also warned to treat UFO sightings with a restricted clearance at the very minimum and forbade the release of any information to the public except through Blue Book channels unless the sighting was positively identified. By decreasing attention on investigation and increasing the restriction on public information, the Air Force hoped it could successfully defuse (what the CIA had convinced them was) a growing hysteria over UFOs. After a brief stint with Ruppelt’s former assistants heading up Blue Book, Captain Charles Hardin assumed command of the project in March of 1954 with only a two-man staff at his disposal. Because of Hardin’s meager resources, most field investigations by that time were being conducted by the 4602nd AISS. Hardin was assigned the task of concentrating Blue Book on countering public criticism and implementing the CIA’s Robertson Panel recommendations which were made known to ATIC sometime by 1956. The 4602nd, however, soon found itself in trouble with the dreaded saucer killer Harold Watson who had regained full reign of ATIC. He felt its men were classifying too many sightings as unidentifieds. Hardin and astronomical advisor to the Air Force, Dr. Hynek (then still more of a UFO debunker than advocate), compiled a field guide known as the UFOB Guide. The UFOB Guide used categories for the 4602nd to more conveniently organize its data into explainable conclusions. Hardin suggested “common sense” as the best way to rule out witnesses’ stories that seemed to contain contradictory evidence. Thus, unique or extraordinary details of sightings were not entered into the Blue Book files. As a result, unknowns fell from 60 percent in 1954 to 5.9 percent in 1955 and 0.4 by 1956. Ironically, as the number of unknowns fell, total UFO reports steadily increased.